"Toyota looks to dominate 'partner robot' business." continues CTV News. Toyota Motor Cop,. Partner Robot Div. General Manager Akifumi Tamaki speaks with Toyota partner robot HSR during an interview at the International Robot exhibition in Tokyo on Wednesday, Dec. 2, 2015. 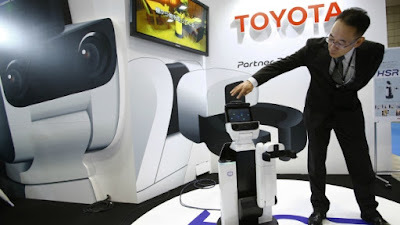 Toyota Motor Corp. is harbouring big ambitions to become a significant player in the growing market for robots that help the elderly and other people get around in everyday life. The company believes it can use its manufacturing expertise to become as crucial in a field it calls "partner robots" as it is to auto-making. Robotics engineers at Toyota currently number only 150 out of a worldwide staff of 300,000 but it is plowing money into research and development. Toyota last month announced a $1 billion investment in a research company headed by robotics expert Gill Pratt in Silicon Valley to develop artificial intelligence and robotics. It is already working with Stanford University and the Massachusetts Institute of Technology on robotics. "We are preparing for a future in which people may not be able to drive cars, or they may need artificial intelligence to support them to drive, and once they get off their cars they may need help from partner robots," said Akifumi Tamaoki, general manager of Toyota's partner robot division. The Japanese government is banking on robotics as a growth industry in a society that's aging at a faster pace than any other industrialized nation. Other companies have jumped in, including Internet company Softbank Corp., which is selling a humanoid that carries on simple conversations. Speaking to The Associated Press at a Tokyo robot show this week, Tamaoki said Toyota's robotics interests go back decades, including their use in manufacturing at its auto plants. But it now sees the technology as a viable business in its own right.